Deborah and Robert Smyth in “Shadowlands” at Lamb’s Players Theatre. A power couple portraying a power couple. 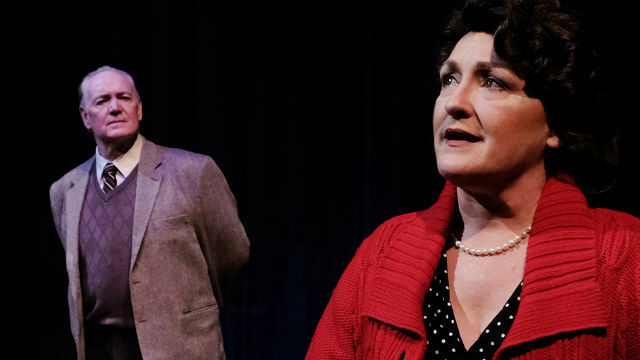 Deborah and Robert Smyth did a smashing job last year as George and Martha in Intrepid Theatre’s “Who’s Afraid of Virginia Woolf?” (both won Outstanding Lead Performer honors at the San Diego Theatre Critics Circle awards event last month). Those roles exposed the brutal side of a twisted love relationship. Now, back on their home turf at Lamb’s Players Theatre, where he’s producing artistic director and she’s associate artistic director, they’re displaying the tender side of marriage. “Shadowlands” marks the 37th year that the Smyths have shared the same stage. And like brandy, beef or rum cake, they’ve only gotten better with age. In this drama based on a true story, late love may be the deepest of all — however short-lived. (The play was last produced in San Diego in 1995, at North Coast Repertory Theatre). C.S. Lewis (1898-1963) was a distinguished British literary scholar, Christian apologist, fantasy/sci-fi writer — and confirmed bachelor. Joy Davidman (1915-1960) was an American, Jewish-born Christian convert, a poet, lover of literature — and a divorcée. A more unlikely couple is hard to imagine. And yet, after years of a lively correspondence, they finally meet — and intellectual sparks fly. This forms the delightful first act of William Nicholson’s 1989 drama; the repartee is irresistible, though the play gets bogged down in Lewis’ religious disquisitions. And in fact, there was plenty of suffering in store for these soul-mates. Lewis was 17 years older than Davidman. He was 54 when they met in 1952. He married her first in a civil ceremony (1956), in friendship and formality, just to assist with her citizenship, so she could remain in Oxford after her divorce. But a year later, after serious illness struck, he realized how much he loved her, and went through all kinds of mental machinations to rationalize his ability to be joined with her in an Anglican wedding ceremony. They were only to have three blissful (though often pain-filled) years together. Heartbroken thereafter, he only lived three years more. It’s a poignant love story, and the Smyths convey every aching inch of it — the shared literary enthusiasm, the smart sparring, the gentle caregiving and the deep, whole-hearted commitment. Although Lewis’ coterie of cronies (his fellow university dons, and others) was important in his life, they feel extraneous here (though they’re played as — and by — an impressive array of characters: John Rosen, Paul Maley, Jonathan Sachs and Jordan Miller). Brian Salmon (always a delight onstage, especially in mordant Brit-mode) gives a wonderful arc and depth to Lewis’ brother and housemate, Warnie, who is at first skeptical of Joy, but grows markedly in his warmth and affection for her. Young Gavin Reid August does a fine job as Joy’s dutiful, fantasy-loving son, Douglas (she actually had two sons by her first husband). We root for Jack and Joy, and curse the disease that tore them apart. And maybe even weep a little when the inevitable comes. It all happens on Mike Buckley’s marvelously flexible set, with two ceiling-high book shelves and various furniture pieces gliding smoothly on and off for different locales, aided by Blake McCarty’s projections, Nathan Peirson’s lighting and Jeanne Reith’s tweedy ‘50s costumes. The play has some slow moments, but when brilliant minds connect and ignite (and talent re-creates it so well) fireworks are bound to ensue. Performances are Tuesday-Thursday at 7:30 p.m., Friday-Saturday at 8 p.m., with matiness Wednesday at 2:30 p.m., Saturday at 4 p.m. and Sunday at 2 p.m.